Page from the account records of William Jackson Walton, later Superintendent of Louisa County Schools 1884-1886. Last date on account is Jul 1, 1859. W.J. Walton lived in the Jackson District off of what is now Paynes Mill Road. Items on account include various agricultural and personal items, such as various seeds, fabrics, soaps, etc. The Waltons owned what was an average farm in Louisa County before the war. 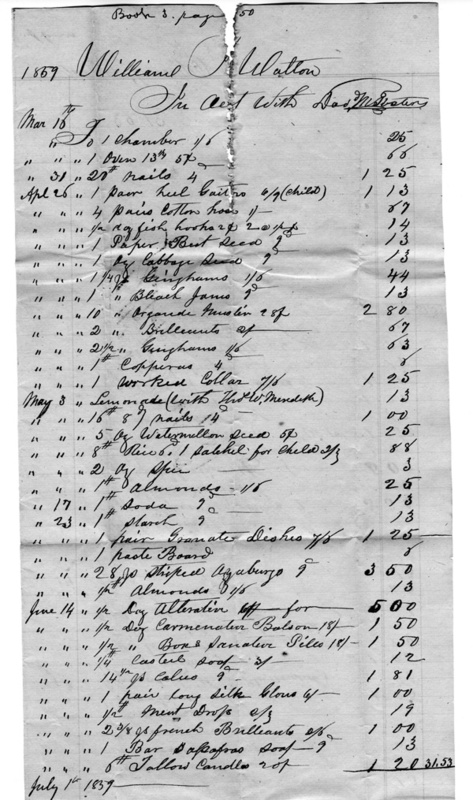 Papers of William Jackson Walton , “1859 Store Account ,” Piedmont Virginia Digital History: The Land Between the Rivers , accessed April 25, 2019, http://piedmontvahistory.org/archives14/index.php/items/show/32.